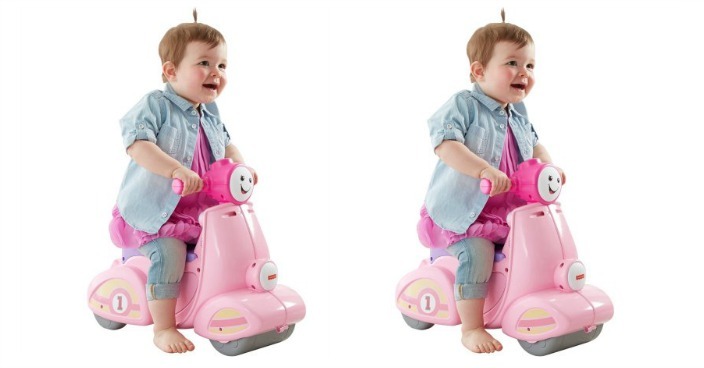 Fisher-Price Smart Stages Scooter Just $28.13! Down From $48! You are here: Home / Great Deals / Fisher-Price Smart Stages Scooter Just $28.13! Down From $48! Right now you can get this Fisher-Price Smart Stages Scooter for just $28.13 (Reg. $48) at Walmart! Laugh and Learn Smart Stages Scooter helps get motor skills rolling. While scooting along, baby is rewarded with cute phrases, sound effects and song ditties. By pressing the working horn, baby is rewarded with more songs and sound effects. Pushing the three buttons on the dashboard teaches numbers, shapes, opposites and more! There’s even a clicker key to put baby in the driver’s seat of early role-play fun! With three levels of play that grow with baby, this scooter provides non-stop fun right through the toddler years! Laugh and Learn Smart Stages Scooter includes Smart Stages technology, an exciting new way to change learning content as baby grows. Every baby develops at his or her own pace, and Smart Stages technology gives you the ability to select the stage that’s best for your child! There are a variety of developmentally appropriate songs, phrases and sounds within three levels of play — just slide the switch for level changes.